We're going to have to wait quite a while before we see Black Adam duking it out with Shazam on the big screen. Those who enjoy DC Comics are familiar with this rivalry and it's one that has been poised to make its way to the movies for some time, ever since Dwayne "The Rock" Johnson became attached to the role of Black Adam years ago. Now, according to one of the producers of the upcoming Shazam movie, the in-development solo adventure centered on the big DC bad guy will be coming down the pipeline before the showdown commences. Peter Safran, one of the key producers of Shazam!, has been making the rounds to promote the movie, which hits theaters next month. 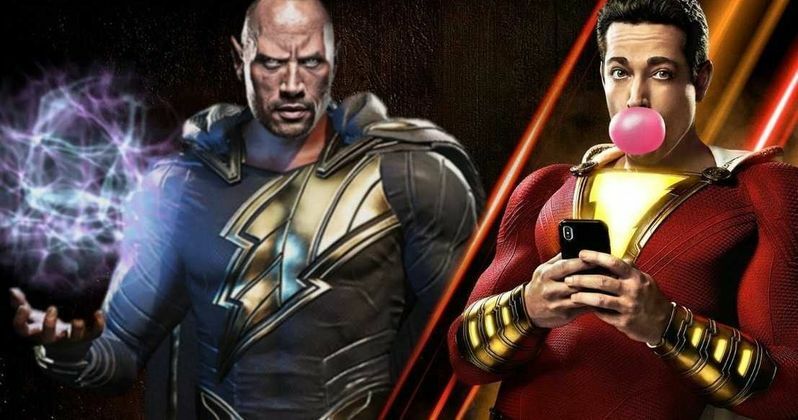 Recently, he was asked about the (hopefully) inevitable showdown between Dwayne Johnson's Black Adam and Zachary Levi's Shazam. Unfortunately, his answer doesn't provide us with any hope that it will be happening soon. Here's what Safran had to say. "Listen, we don't know but I've gotta believe that there's gonna be a standalone Black Adam movie before there's ever a movie with Shazam and Black Adam sharing the screen." Originally, the plan was to have Black Adam as the villain in this first Shazam movie. Instead, it was decided that Dwayne Johnson should be given a standalone movie first. Doctor Sivana, as portrayed by Mark Strong, is instead serving as the bad guy in Shazam. So, that means the studio has to work around Johnson's very busy schedule, get Black Adam made, then plan another movie in which these two can duke it out. Given how slow the gears turn in Hollywood sometimes, this sounds like it may never actually happen. Though, The Rock's camp is confident Black Adam will happen at some point. Peter Safran spoke a bit further about the shift in DC Films, following the release of Justice League, that has put a much stronger focus on telling satisfying, individual stories. "Yeah I think that is the goal, it is giving heroes their time to shine and not feeling like you have to shoehorn in some universal connection amongst them all. The studio's been incredibly supportive and DC's been supportive about saying take the time that you need to introduce these characters in the right way and tell the stories that you really want to tell, and that the audiences really want to see with these characters." Truly, it may have felt rushed to introduce both of these characters in the same movie and include a satisfyingly epic showdown. Hopefully, this clash doesn't fall by the wayside as a result of the business side of things getting in the way. Shazam, which has been getting very solid buzz so far, is set to arrive in theaters on April 5. For now, Black Adam is without a release date. This news was first reported by Comicbook.com.